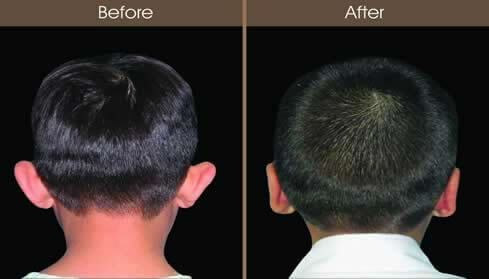 8 year old male concerned with prominent ears underwent ear reshaping (otoplasty). He and his parents were concerned that the ears protruded too much and would attract undesired attention from his classmates as he grew up. The procedure involved ear reshaping (otoplasty) utilizing a combination of suture techniques. Mustarde sutures (concha-scapha sutures) were used to help reduce the prominence and bring greater definition to the ear anatomy. In addition, concha-mastoid sutures were used to reduce the ear prominence.